Hunh. I wonder what that sign means? You see her everywhere: She’s wearing an above-the-knees, flared skirt that was probably never stylish in any country of the world. She’s not trying to make a fashion statement, though; she’s making a “this-is-a-women’s restroom” statement. Her ludicrously square-shouldered male companion stands nearby. Public information signs started appearing in train stations in the mid-19th century, but they weren’t standardized until almost a century later. That got me wondering: Who decides? Is there some governing body that rules that the symbol for restaurants is a fork and knife, even in countries that use chopsticks? The answer is yes, there is sort of a governing body, the International Organization for Standardization. The thing is, there are a lot of other organizations that make their own proposals and ignore the ISO at times. For instance, many of the symbols now in use were developed in the 1970s by AIGA (originally the American Institue of Graphic Arts), in cooperation with the U.S. Department of Transportation. The work of AIGA had been influenced by some Austrian designers in the 1930s who had experimented with symbols as substitutes for words. The history of the stop sign helps to illustrate the point that these symbols don’t spring into existence when some authority renders a judgment for the entire planet. Michigan was starting to make automobiles in the early 20th century, so it figures that it also made the first stop sign, in 1915. It was square — two feet by two feet — and had black letters on a white background. In 1922, there were enough stop signs around the United States that a committee was convened by the American Association of Highway Officials to standardize them. The committee made its recommendations, but that didn’t stop those who had other ideas about stop signs. A group of engineers in the Mississippi Valley insisted that the more sides a sign has, the more it conveys danger. That’s when the octagon shape began to be used — lots of sides, you see. Let’s skip over the many modifications that were made during the next several decades, such as the change in 1954 from yellow to red as the background color. The current shape and color became U.S. law in 1966, and two years later they were adopted by — get this — the Vienna Convention on Road Signs and Signals, which was part of a UN Economic Commission. That applied the stop sign standards world wide — more or less. 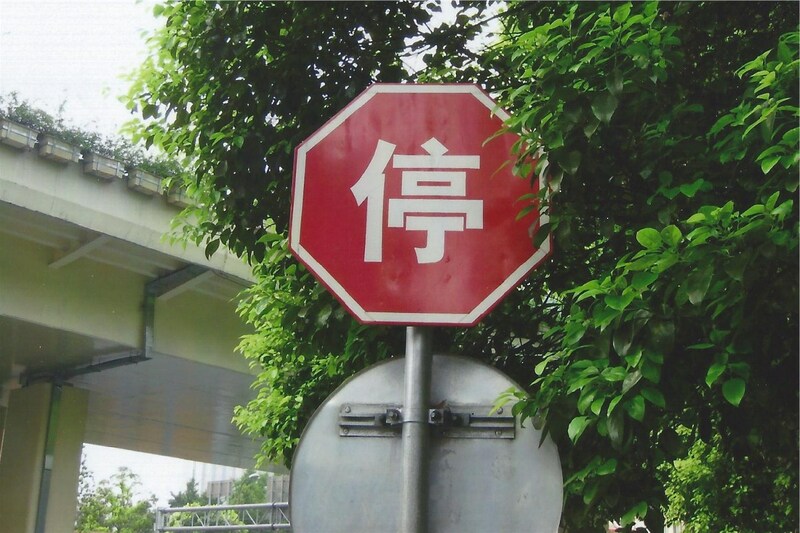 There are still some countries, like Zimbabwe and Pakistan, that prefer their own stop-sign design. Let’s face it — getting a couple of hundred countries to agree on anything isn’t easy, and can take many years. That’s why some committee had better get to work right away on a new symbol for women’s restrooms. In fifty years, do you think anyone will know what a skirt is? This entry was posted in Language and Literature and tagged AIGA, restroom signs, stop signs. Bookmark the permalink. In Seattle, the restroom sign for women could confuse, since some men wear leather kilts. The Ford Escape we rented in Hawaii had an array of buttons with symbols. I flunked the test after my interpretive skills fell well short of the mark when she asked me to close the moon roof cover. Since the owner’s manual was not in the glove box, it was like pulling a slot machine hoping the winning combo would show. In Poland the rest room sign for a man is a circle, with a triangle for a woman. Or maybe it’s the other way around. Either way you have a 50/50 chance of guessing correctly. An even more reliable indicator (assuming one isn’t in a big hurry) is to watch the traffic in and out of the restroom. If you’re looking for a men’s room and you spot one that’s being used primarily by men, your odds of making the right choice are much better than 50/50! Thanks for the comment. I love the road signs in Australia that denote kangaroo crossings. I haven’t researched this, but I’m pretty sure Australia is the only place in the world that has kangaroo crossing signs. Even so, visitors from other continents can probably understand what that sign means.